You've mention this before but it really doesn't make much sense. Directors are appointed by the major shareholders of the company (the ones who basically own it) to keep an eye on the running of the company and that it comply's with the wishes of the shareholders accordingly - agreed? As KA is the only shareholder of any significance owning something like 94% of the club, he would be the one to hire and fire Directors and in effect tell them what he wanted the company to do - agree? So it wouldn't matter if he had a million Directors or just himself on the Board because it would amount to the same think - KA being the one to say how the club would be run. I also thought that an unlisted private company had less regulative procedures at Board level to comply with than those that are listed - although I could be wrong about that? You are quite right. The requirements for a private limited company are generally more relaxed. That is the case with Burden Leisure and the Articles of Association were amended (amended articles available on the Companies House website.) The amended Articles require the Board to have a minimum of 2directors. That's the law and Ken knows it. He was challenged on this at the last AGM and his argument was that he 'couldn't find anyone suitable'. Ask someone in the know what good corporate governance is. The answer is exactly the opposite to the way the Club is currently run. @BoltonTillIDie wrote: One outstanding Creditor is the PFA. I thought Ken paid the wages from his own pocket? Bolton Wanderers Football Club can confirm that all outstanding salaries for its coaching and playing staff will be paid into their respective accounts on Friday morning. The delay in payment had been caused after an option with the Professional Footballers Association (PFA) was explored. Although that option does remain in place at this moment in time, it is not the Club’s preferred route. Instead, Bolton Wanderers’ owner and chairman Ken Anderson will personally fund the outstanding salaries. The club would now like all attention turned towards Saturday’s important Sky Bet Championship fixture against Leeds United at the University of Bolton Stadium. Bolton Wanderers will not be making any further comment on this matter. I've already explained what happened earlier in this very thread. HOh I didn’t realise you was in know. The town of Bolton should demand clarity on this. 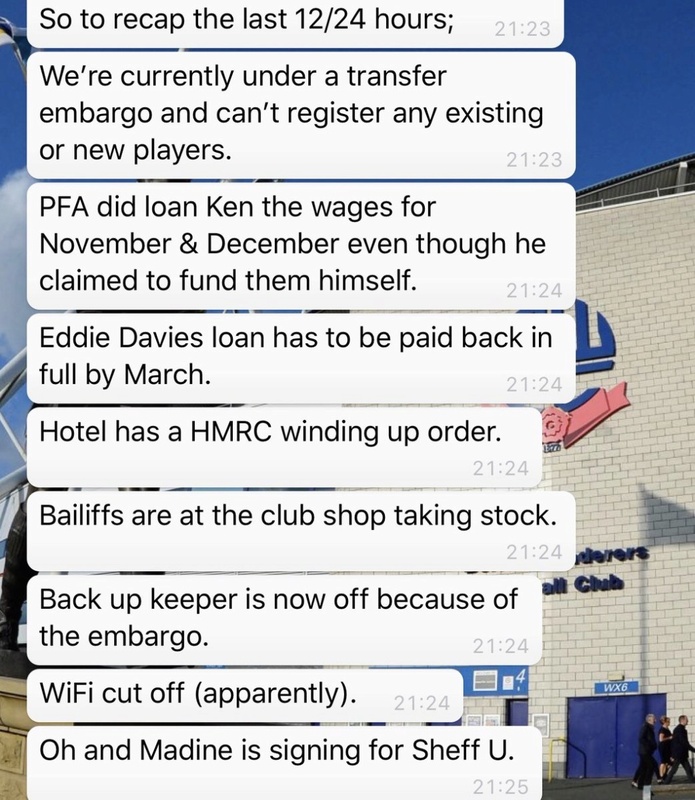 Bolton Wanderers issued a statement last month saying Ken Anderson will pay all outstanding salaries and said they preferred the PFA not to. Our story tomorrow says the PFA did in fact pay those salaries. @Natasha Whittam wrote: I don't see it as trolling, I just see it as a differing point of view. Well considering I clearly hadn't said any of the stuff he was basing his arguments against me on, I would disagree completely. He was looking for a reaction - and not for the first time by a long, long way. I even still had the decency to answer another genuine question from him on the same thread, and he still continues with an argument that he was clearly making up on the fly. I know it was trolling, he knows it was trolling and you're certainly not innocent enough to believe it wasn't either! I'm prepared to accept a bit of 'flack' from time to time but it's becoming constant from him these days and a line needs to be drawn. I don't believe that to be unreasonable of me. To ban me and then write the above is ridiculous, nobody in their right mind would read my comments as trolling - it's an easy way for to dismiss perfectly valid criticism. There was a time on here when you got banned for serious abuse or offensive material, not just for questioning the site owner. You've explained what you think happened. This version of events is not factual. Couldn't possibly be wanting to start another argument for arguments sake, could you? I was clarifying post 35, which suggests you’re in the know. I’ve no issue with the original. Careful Cajun you'll upset Sluffy by reminding him of the facts.